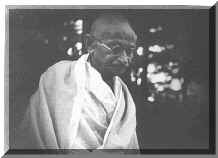 Role and contribution of Mahatma Gandhi in the freedom movement of India is noteworthy, extraordinary and exemplary. And those who are familiar with the whole series of events of the national liberation movement of the county know how he awakened the masses on the strength of Ahimsa-the non-violence; made them realized the value of independence and accorded Satyagraha-the best and infallible weapon and called them cut down their centuries old chains of slavery. People of India, crores in number, came to the forefront and ultimately in the year 1947 India became free from the political rule of the English. Here one important thought comes to my mind time and again and it is my duty to clarify it before you. Most of the people consider India’s political freedom to be the goal of Mahatma Gandhi’s life; they think that to make his country free from the English has been his aim. It is but natural if they think so. Most of the time of his life he spent to make his nation free politically; for 25 years [1917-42] he continuously lead his compatriots for this purpose. Besides this, more than ten years he spent in different prisons of the Empire while fighting for the freedom. But, in spite of the fact that the first goal of Mahatma Gandhi’s life was to achieve freedom for India, it was not the end of his mission. If it would be so, how would he be considered the ray of hope by millions around vthe world? How would he become the source of inspiration for Martin Luther King Junior, Nelson Mandela, Ninoy Aquino, Bisweshwar Prasad Koirala and other great men of the world? How even today would he inspire people in counties like Thailand where they carrying Mahatma’s pictures in their hands demonstrate on the streets? It clearly indicates that life, work and views of Mahatma Gandhi were for the welfare of whole of humanity; the way he showed through his dynamic actions was, and is, for the entire world; India’s freedom was only a dimension on his way. So, those consider only India’s freedom to be the goal of the Mahatma life, work and views, they must rethink and should change their opinion by becoming familiar with the reality that Gandhi’s philosophy and his actions have been dedicated to his belief in the unity of human life which is a synthetic whole and can neither be divided in spheres like social, religious, political, moral or ethical nor it can be classified in levels like individual or collective, local or international. It was Gautama the Buddha, who for the first time in Asia, two thousand five hundred years ago emphasizing on reality of Law of Change called upon humanity to break the chains of all bonds which make it slave at different levels and different planes. He showed the best way to the masses to get rid of their problems and to lead life based on equality, peace and prosperity. Simultaneously, he said what he was saying even that too was not beyond the Law of Change; it was the process and nothing could be exception to it. It meant what he said and suggested for the welfare of mankind, even after being the best in his own time, could not be hundred percent applications in times to come. However, Buddha’s way, teachings and suggestions can even today become source of inspiration if they are applied according to demand of time and space. It is the height of his way. And that is why; he is rightly called the Light of Asia. Besides Shakyamuni Gautama, it was Mahatma Gandhi who for the first time in the entire human history through his mass actions on the basis of Ahimsa-the non-violence showed such a unique way to humanity which apart from being welfaristic, exemplary and the best, become the source of inspiration for many in the world, as said already, and if it is applied today anywhere or any time to come, according to prevailing conditions of time and space, it is capable to bring beautiful results. For this reason Mohandas Karamchand Gandhi raised to the position of a Mahatma; people around the world respect him on the one hand, they have curiosity toward his acts and through them trying to get rid of problems and conflicts at different levels and different planes.